Last year, under pressure from my real-life and Twitter pal @kikkiplanet, I devised a top twelve list of Twitter accounts to follow in Fort McMurray (or #ymm as we say in the Twitterverse). It was a bit of a lark, done when she threw down the gauntlet after devising her own list and suggesting I do the same. What I wasn't ready for was the response, you see. People took it seriously. I mean, it was a list made up in my head, based on my own criteria, and with little input from others. But the feedback I got on that list was astonishing, from those who were on the list, and those who were not. I considered not even doing a list this year, but then someone told me that they had been aiming to get on the list all year. Now I was really backed into a corner and realized this list isn't optional but almost required - and so here it is, the 2013 made-up-in-my-head list. This time I did go to Twitter and ask for nominations, and while those had some influence in the end the list is of my making and no one else should take any blame. And there were some disqualifications this year, too. If you were on the list last year you won't find yourself here this year, because a new year is about new opportunities, and I decided to make this list fresh. Now, everyone who was on the list last year continues to be must-follows if you want to understand Fort McMurray, but they have some new companions on the list in 2013. The other disqualification was any Twitter account I have anything to do with, whether my own or employment related. That seemed only fair, as while I have a healthy ego I try to avoid thumping it too often, because that just makes the Intrepid Junior Blogger's task of keeping me humble through her teenage derision harder. So, here is the 2013 list. There is a random number, so don't go looking for any meaning in how many there are, or which order they are in - except for the very last entry, the one that I believe had the most profound impact on Twitter in 2013. I hope you enjoy the list, and you'll likely think I missed someone or added someone I shouldn't have or otherwise take issue with it - and that's okay. This list is my opinion, and if you think I have some sort of mathematical formula that I use to calculate things then we need to have a wee chat about how I can barely figure out the advertised discount on a pair of shoes. What can one say about someone who gets involved in a variety of discussions, but always does so with dignity and respect? Or who is a true community booster but who does so quietly? The family man who calls this community home and who represents our community well every single day on a social medium that can occasionally be challenging? Well, I guess you say they are a top tweeter, as @longpre11 is. He has impressed me time and time again, and I am honoured to not only know him on Twitter but in real life, too. There has been a real resurgence in the nice-guy category this year on Twitter. @sirk_25 is another one of those nice guys who always interacts with respect, and who is unfailingly kind and encouraging. When he bought lunch for a group of strangers from Twitter, though, finding out where we were dining from Twitter and then calling in his credit card to pay our tab, he went from nice guy to incredible human being in my opinion. I have never met Kris, but I sincerely hope to do so some day, if nothing else to thank him for lunch - and for being such a great community representative on Twitter. The minute I met her I knew I liked her, as who could resist that charming smile? That smile hides a sharp intellect though, and young Aimee Harper came on the news scene during a tumultuous time. Thrown right into covering one of the most contentious elections in years, @aimeemharper brought intelligence and impartiality to her Twitter coverage of debates and events. I hope she sticks around for a long time, and tweets more often, because her unbiased and concise coverage is very much needed. I don't know how he didn't make it on the list last year, really. Jerry has been such a tremendous addition to Fort McMurray it's nothing short of amazing. His advocacy, his sense of humour, and his willingness to use his platform to promote our community is incredible. 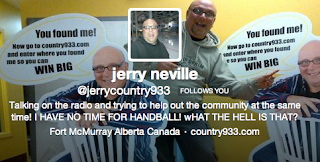 Jerry spends a lot of his free time in the community devoted to local organizations and groups, sharing many of those experiences on Twitter, and his commitment to this place is the real deal. @jerrycountry933 is one of my heroes, frankly, and it is an honour to call him my friend - even if I never listen to country radio. Dear lord how she makes me laugh every morning. I miss her when she is away, that voice I wake up to that has no problem making fun of herself and showing that she is far from some radio diva but rather a real person with challenges and problems and an amazing sense of humour. If you have never listened to her on the Mix Morning Show then you must, just to hear @APradioh share stories of single parenthood told with honesty. Sometimes she makes me shake my head - but every single time I just come back to how much I adore her. She is just as honest and funny on Twitter, meaning Amanda is the real deal, through and through. Arguably the most handsome media personality in #ymm, active on Twitter in his promotion and defense of our community, and a hometown boy, Steve is not only a radio host but involved in film-making and now a weekly columnist with the newspaper. Not a reactionary, but rather incredibly measured in response given his age, @steve_reeve is a must-follow from the local radio and twenty-something scene - and besides he is simply a genuinely nice guy, which is so refreshing to find these days. And he is funny too, a bonus. And easy on the eyes. Total bonus. What do you say about a young man who has the sole goal to improve our world - at the age of twelve? He recounts his exploits on Twitter and shares his triumphs and his challenges, including his recent trip to Africa to see the community water projects his hard work over the last two years helped to fund. This young man has done more in his short time on this planet than many of us have done in decades, and if you want to find inspiration and hope for the future then you must follow @thelegofly - because this kid is going places, and you don't want to be left behind. I always look for her tweets, I love our interactions, and I find her endlessly entertaining, even when she talks about hockey. This young woman splits her life between Edmonton and Fort McMurray, and brings with her such enthusiasm and humour that you can't help but adore her. I have had the chance to meet @julieEY person and she is just as lovely as she seems on Twitter. This is a must-follow for amusement, and for a fresh perspective on the community. Oh, this bird! Twitter was made for the eclectic personality, and what could be more eclectic than a bird with a lust for garbage and a wit as sharp as his beak? If you want to laugh you must follow @FortMacRaven - but be ready, because the bird spares no one and will eagerly rip into whatever garbage you left lying around. Sadly this is not an active account, because it was all about a dead, brown, dried up Christmas tree that was left on the bridge when someone left their load untarped. The intriguing part is that the tree was there long after Christmas, in plain sight but ignored, until someone gave it a Twitter account to share its plight and desperate plea to get off the bridge. It was an incredibly interesting exchange, and for me it was a catalyst to think about all the other "in plain sight but ignored issues" in this community. @YMMtreeONbridge might have had a limited life span on Twitter - but in that short time made a pretty enormous impact, and did it with a sense of humour, too. There are some politicians who show up on social media around the same time as nominations are announced, staying just long enough to use the medium to improve their election chances and then disappearing in the night without even a second glance back (the Twitter electoral version of the "wham, bam, thank you ma'am") - but not Keith McGrath. Keith was active on Twitter prior to running for election, and has stayed active afterwards, sharing his thoughts and his activities. And recently when @McGrath_K found out on Twitter about the power outage in Gregoire leaving hundreds without power for hours in freezing temperatures he went there to offer assistance - using Twitter to help others, not help himself. For that he earned my admiration, my respect, and my must-follow recommendation. Some politicians use Twitter to get elected and disappear, while others just seem to have trouble getting the hang of the power of the medium. Using Twitter to argue with constituents (including the Intrepid Junior Blogger at one point, a farcical moment in my house), and tweeting in support of a controversial and embattled mayor seem questionable political strategies, but they are interesting. Follow @BrianJean_MP for his political position, but stay for the shenanigans. I disagree with him. Often. And yet I still follow him, because he has interesting points of view, and because his commitment to this community is genuine. Half the time I don't know what he's on about, and the other half I am on the verge of arguing with him - but all the time I am appreciating his passion and interest in our home. Follow @tomremax for realty knowledge and advice - but stick around for the opinions and community engagement. They tweet about delayed flights, the weather, and other practical matters. But it was the time they tweeted about the broken ATM in the airport, suggesting travellers in need of cash stop at the nearby hotel for an ATM, that got me. The Fort McMurray Airport is getting it right, providing not just the basic information but small nuggets of help to their Twitter followers. If you fly out of YMM then you must follow @FlyYMM, especially as we get closer to the opening of the new terminal, and all the new possibilities that will bring. I think what I like most about these guys is their bio. They maintain a Twitter presence, and are helpful and responsive, but they are upfront about not monitoring their account 24/7 - and they thank us for being part of our community. I'm impressed by that, and I never even use @diversifiedFTM busses - but if you do you should be pleased to know that these guys are doing social media right. These guys are pretty terrific, especially in a community of young families. They tweet about events and matter important to parents, and they do so in a timely manner. They are positive and they share articles from their magazine, but they are not all about self-promotion, which is just as it should be. Got kids? Then follow @FMChildMagazine on Twitter! The immediacy of Twitter is perfect for an organization like the Wood Buffalo Food Bank. In seconds they can share their need for certain goods with thousands of people, and stock their shelves with the items they have in shortest supply. @WBFoodBank is effectively using Twitter to communicate who they are and what they need, and are using a medium that is free and simple to do so. They are a model for other social profit organizations, and an example of how to use Twitter to achieve your social profit goals. One of the biggest challenges of a new organization is making yourself known - but this year the Fort McMurray Filmmakers Association took Twitter by storm, effectively communicating who they are, what they do, and what they hope to accomplish. Through the medium they began to unite local filmmakers, spread the word about their projects, and showed the rest of the Twitter community what they were up to. I'm not surprised, though - each person involved in the association is young, dedicated, and active on Twitter, so combined they are an impressive group. For a new group, it feels like @ymmfma has been around forever - so I would say their Twitter goals for 2013 were definitely accomplished. Maybe he doesn't live here anymore, but Eric is Fort McMurray through and through, and he continues to be active in our community in myriad ways. I don't know how he does it, but he often dips in a spoon and gently stirs the pot, often leaving people guessing if he is serious or not. You can argue with him and he remains polite and respectful while firm in his opinions - and while he might be surprised to be on this list he shouldn't be. I'd say @classicjanvier is a must-follow simply because he gets what Fort McMurray is - and wears no rose-coloured glasses while seeing it. Looking for the worst puns in the world, told with astonishing ease and a quick wit? Then look no further. Not a local but regularly interacting with those on the #ymm feed, even when I don't want to laugh Tom makes me laugh, although some of his puns should be locked up forever. If you want to laugh then follow @pcrtomgillespie - but when the groans start don't say I didn't warn you about the truly terrible puns. She is a communications professional, and she uses her skills to champion our community. Her love of Fort McMurray shines, and her advocacy is strong. She is careful with the written word, and knows the power of a well placed tweet, and she expects others to meet the same high standard she sets for herself. She is @KiranMK0822, and I am proud to call her my friend, as well as my fellow community advocate. Yes, yes, I know Twitter is about words and not pictures, but we are visual creatures and so these two photographers have not only captured the essence of our community through their photos but have also captured my heart. I follow them because they are both artists, seeing life here through their lens, and sharing it with the rest of us through their Twitter accounts. Both @140notes and @williamvavrek are skilled photographers, and both allow us to see Fort McMurray through another medium - photography. What I try to do with words they do with pictures, and I think to tremendous effect. He doesn't even live here and yet he might just be the biggest community booster we've got. Cody defends the industry with a passion, and does so with facts and figures and not just rhetoric. His passion is of tremendous value to us, and his friendship runs deep. It is comforting to know that @codyincalgary has our back - because you can never have too many loyal friends. I admit it. I know nothing about sports. I am trying to learn, and so I follow local sports people from whom I wish to learn by osmosis (or at least their tweets). Robert isn't just a "sports guy" though - he's a damn fine writer and a great person to chat with on Twitter too - so give @novacanuck a follow, even if you are not into sports. And if you are into sports maybe we can do coffee sometime and you can educate me. God knows I need it. There is one account in the local Twitterverse that had huge impact in 2013. It began as an anonymous account, and people were dying to know who it was. People asked if it was me, and all I could do was helplessly shake my head, because I knew it wasn't but didn't know who it was - until one day when a friend and coworker came to me and told me it was them. I could not have been more proud, because this person changed the dialogue in Fort McMurray. With relentless optimism and positivity (too much for some people on occasion) they shared their love of our community, and promoted it without seeking the spotlight. They even inspired parody accounts, one that was mean-spirited in nature but that showed the true success of the original, because every hero needs a villain. In 2013 one Twitter account stood apart and above, and I was honoured to be at small lunch where the individual behind the account revealed their identity. For their contribution, their kindness, their dedication and commitment, I name @PositivelyYMM the #ymm must-follow of 2013. To be able to say that the person behind the account is a friend, coworker, and every bit as positive and warm as he seems to be on Twitter, is a genuine honour. So, to Jamie I say thank you - for bringing something new and fresh and wonderful to Twitter in 2013, and beyond.